A place of beauty remains so when it’s in the capable hands of a responsible management team, a caring staff and a group of residents who do their part to preserve and protect it. Such is the case at Pennswood Village, where taking responsibility for the land is as important as enjoying it. Our beauty has many layers! Call 215-504-1118 today for a personal appointment. 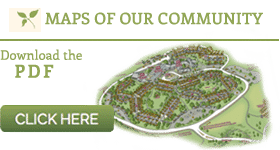 As you ramble our 82 acres, you can be confident that this place of beauty is backed by a not-for-profit commitment to our residents, which includes upholding a coveted accreditation and providing a very affordable alternative to living at home.